This research investigated the use of electronic journaling to promote collaboration between special education and general education preservice teachers. During the field experience component of their methods courses, the participants responded to weekly prompts, shared experiences with each other, and frequently offered advice about events their peers had described. Qualitative analysis of those exchanges yielded 15 subthemes within six major themes. Geer, C. & Hamill, L. (2007). An Online Interdisciplinary Discussion:Promoting Collaboration Between Early Childhood and Special Education Preservice Teachers. 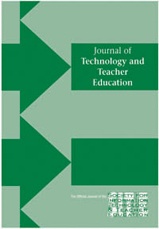 Journal of Technology and Teacher Education, 15 (4), 533-553. Waynesville, NC USA: Society for Information Technology & Teacher Education. Retrieved April 21, 2019 from https://www.learntechlib.org/primary/p/21954/. Allen-Malley, M., & Bishop, P.A. (2000). The power of partners: Two teacher teams [electronic version]. Schools in the Middle, 9(8), 26-30. Blackboard, Inc. (2000). Blackboard 5 level one instructor manual. Washington, DC: Blackboard. Dana, N.F., & Silva, D.Y. (2003). The reflective educator’s guide to classroom research: Learning to teach and teaching to learn through practitioner inquiry. Thousand Oaks, CA: Corwin Press. DeWert, M.H., Babinski, L.M., & Jones, B.D. (2003). Safe passages: Providing online support to beginning teachers. Journal of Teacher Education, 54(4), 311-320. Edens, K.M. (2000). Promoting communication, inquiry, and reflection in an early practicum experience via an online discussion group. Action in Teacher Education, 22(2A), 14-23. Edens, K.M., & Gallini, J.K. (2000). Developing a discourse community of preservice teachers in a technology-mediated context. The Teacher Educator, 35(4), 64-82. Fendler, L. (2003). Teacher reflection in a hall of mirrors: Historical influences and politic reverberations. Educational Researcher, 32(3), 1625. Fisher, D., Frey, N., & Thousand, J. (2003). What do special educators need to know and be prepared to do for inclusive schooling to work? Teacher Education and Special Education, 26(1), 42-50. Friend, M., & Cook, L. (2003). Interactions: Collaboration skills for school professionals (4th ed.). Boston: Allyn & Bacon. Hamill, L.B., Jantzen, A.K., & Bargerhuff, M.E. (1999). Analysis of effective educator competencies in inclusive environments. Action in Teacher Education, 21(3), 21-37. Heflich, D.A., & Putney, L.G. (2001). Intimacy and reflection: Online conversation in a practicum seminar. Journal of Computing in Teacher Education, 17(3), 10-17. Hobbs, T., & Westling, D.L. (1998). Promoting successful inclusion through collaborative problem solving. Teaching Exceptional Children, 31(1), 12-19. Kurtts, S., Hibbard, K., & Levin, B. (2005). Collaborative online problem solving with preservice general education and special education teachers. Journal of Technology and Teacher Education, 13(3), 397-414. Moore, J.L., & Marra, R.M. (2006). A comparative analysis of online discussion participation protocol. Journal of Research on Technology in Education, 38(2), 191-212. Vonderwell, S., & Zachariah, S. (2006). Factors that influence participation in online learning. Journal of Research on Technology in Education, 38(2), 213-230. Wade, S., Niederhauser, D., Cannon, M., & Long, T. (2001). Electronic discussions in an issues course: Expanding the boundaries of the classroom. Journal of Computing in Teacher Education, 17(3), 4-9. Wood, M. (1998). Whose job is it anyway? Educational roles in inclusion. Exceptional Children, 64(2), 181-195.